If you have unconsumed cooked rice and chicken wings, or excess carrots at home, use this recipe to turn them into a tasty stuffed braised cabbage dish! 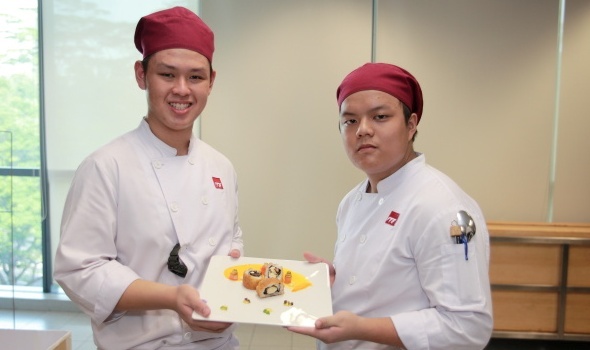 This recipe is developed by Muhamad Haiziq and Ng Shi Long, Western Culinary Arts students from ITE College West. 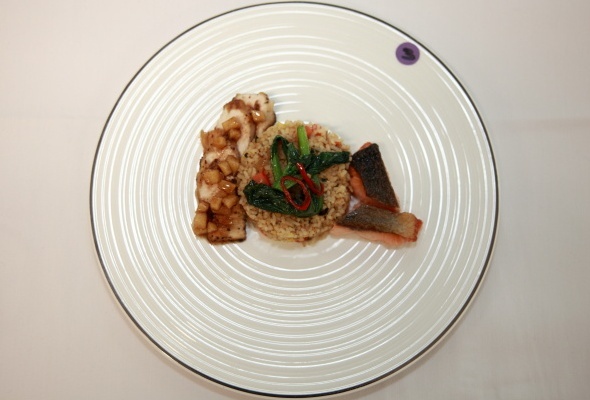 This recipe was the Winner of our Save Food Cut Waste Recipes Competition 2016. 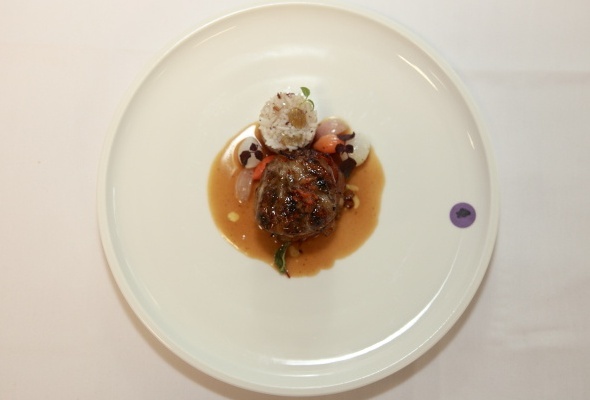 Cut mirepoix (onion, carrot, celery and leek) into brunoise then cut mushroom into small dice. Using a pot, add in olive oil and put in the bacon. Cook until the bacon release its fat then remove to set it aside while leaving the fat in the pot. Using the same pot, add in the mushroom first follow by carrot, onion, celery and leek. Add in the salt and black pepper and sauté till light brown. Add in the cooked chicken and continue to cook for a minute. Add in the chicken stock as well as the chicken jus to give a more concentrated flavour. Once done, add in the chopped parsley. Let the mixture reduce until the liquid to achieve the right consistency. Blanch the Round cabbage till soft and put into an ice bath to stop the cooking process. Remove the Round cabbage from the ice bath and pat it dry. Place the Round cabbage into a circle mould and add in the chicken stuffing until it full. Wrap it well. Using a strip of bacon (fat facing downward), wrap it around the parcel. Once done, tie the cabbage parcel till it is tie and firm (using a butcher strings). Set it aside. Using the sauté pan, add in olive oil follow by butter. After infused, add in the cooked rice, salt and black pepper. Sauté for a minute. Turn off the heat, add in the golden raisin and mix it well. Serve with cabbage parcel. If you have excess apples, oranges and carrots at home, use this recipe to turn them into a delicious brownie dessert! 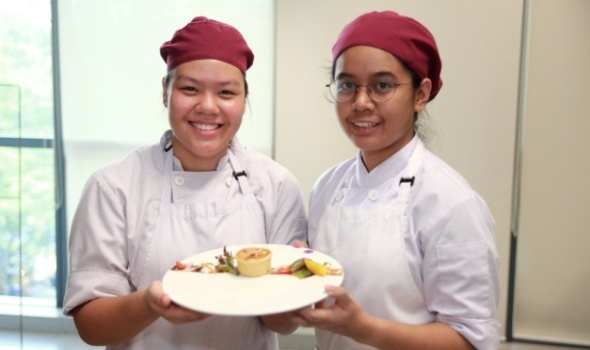 This recipe is developed by Ang Hui Ying and Iffah Liyana binte Johari, Pastry and Baking students from ITE College West. Excess Apple (Shredded) – 1 no. Excess Carrot (Shredded) – 1 no. Gelatin sheet (melt) – 1 no. Orange Zest – 0.5 no. Toast the walnut slightly and shred the carrot and apple. Melt the butter and dark chocolate. Whisk in the eggs, brown sugar, vanilla extract, self-raising flour and cinnamon powder to the butter and chocolate mixture. Fold in carrot, apple and walnut. Bring to bake at 160 degree Celsius for 25-30 minutes. Let it cool in chiller. Fold in the melted mascarpone cheese and gelatin sheet to the yolk mixture. Chill slightly the mixture before folding in the whipped cream and orange zest. Bring the water and sugar to boil. Add in peanuts, continue to stir until all water evaporate and sugar crystal start to coat the peanuts. Transfer the peanuts onto baking tray and bake at 180 degree Celsius utill golden brown. Boil the orange juice, sugar, orange zest and glucose. Add in the cream, and allow to boil again. Pull away from heat once boil and pour it over the dark chocolate and mix into a ganache. Add in the cubes of carrots and allow to simmer for 3 mins. 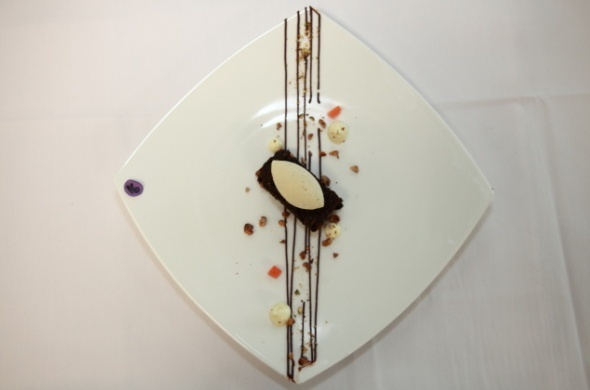 Transfer the chilled crumble onto baking tray and bake at180 degree Celsius for 10 minutes or golden brown. Add in the brown butter. If you have unconsumed rice, chicken wings and breast meat, or excess carrots, use this recipe to turn them into a tasty Golden Maki dish! 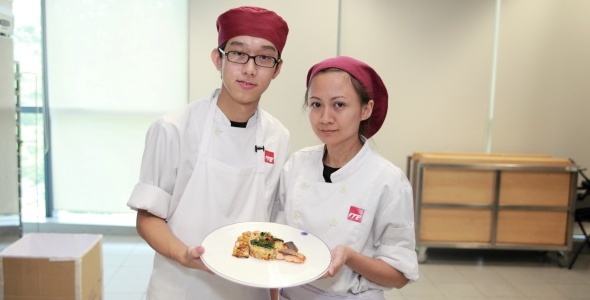 This recipe is developed by Soon Zeng Feng and Dominique Ng, Western Culinary Arts students from ITE College West. Remove sinew, fats and skin from chicken breast. Add chicken breast with cream and egg, then blend it. Pass the mousse through fine sieve. Sweat onion for 3 minutes. Add in the carrot and sweat for another 2 minutes. Add in milk until it covers the carrot. Cook till the carrot is soft. Put 87 grams of Japanese mayonnaise and mix with 8 grams of wasabi. Fold in the chicken mousse with pistachio nuts and season the mousse. Roll the mousse into 4 tubes with cling wrap. Poach the mousse in simmering water for 6 mins till cooked. Put the nori seaweed on the bamboo mat shiny side down. Add seasoned rice vinegar to keep the rice moist. Place the chicken mousse, chicken meat and julienne vegetables on the rice. Roll the sushi with the bamboo mat. Coat the sushi roll with flour, egg wash and cream cracker. 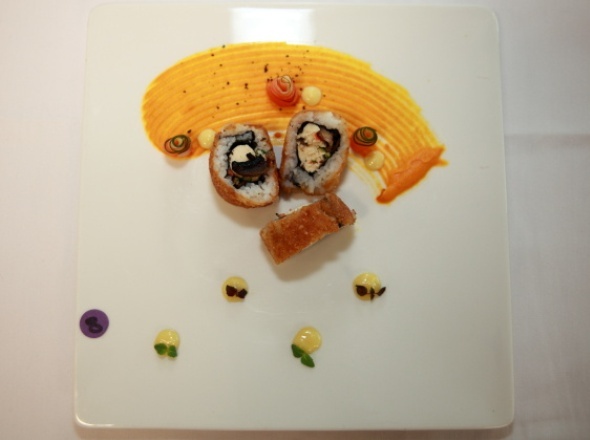 Double coat the sushi with egg wash and cream cracker. Pan-fry the sushi for about 1 min to give the rice a crispy texture. Cut the vegetables into thin strips. Add in 100ml of white wine vinegar, 100ml of water and 80 grams of sugar. Add the vegetables and leave it overnight in the liquid. If you have unconsumed chicken meat, or excess tomatoes and carrots, use this recipe to turn them into a tasty quiche! 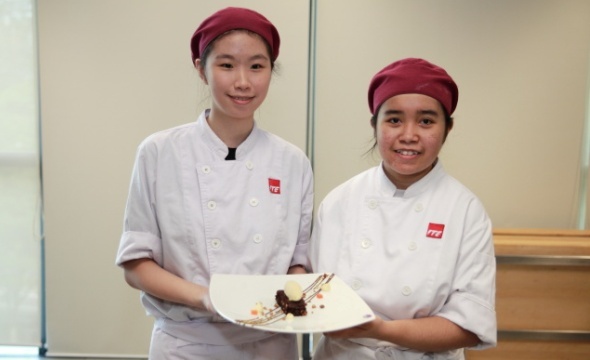 This recipe is developed by Siti Nuraini bte Adenan and Demi Yong Qian Qian, Pastry and Baking students from ITE College West. Whisk all the ingredients and sift through a strainer. Rub in the butter to the flour till sandy texture. Add in the ice water and eggs till a dough is formed. Bring to chiller to rest for 30 mins. Add the filling, pour the quiche sauce to the top of tarts. 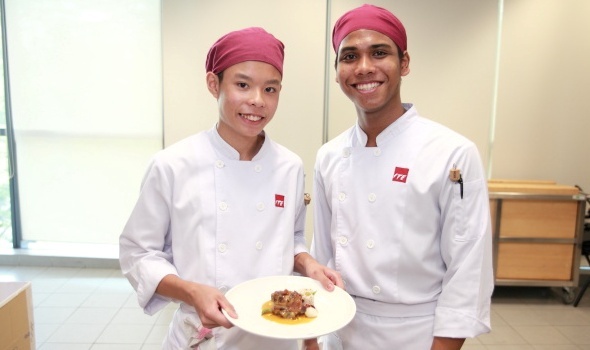 Bring to bake at 180 degree Celsius for 10 minutes+/- or golden brown. Stir well the vinegar, sugar and water. Add in the carrots and put in chiller. Bring the balsamic vinegar, apple juice and sugar to simmer under low heat until desired consistency.